Stan Musial had such respect for the arm of Andy Pafko he included the National League veteran as part of the best-throwing outfield he’d ever seen. It was because he didn’t use that arm, though, that Pafko committed a memorable blunder that literally handed the Cardinals a comeback victory against the Cubs. 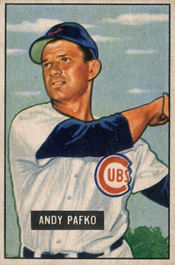 When the Cubs won the pennant by finishing three games ahead of the runner-up Cardinals in 1945, Pafko was the starting center fielder and had 24 doubles, 12 triples, 12 home runs and 110 RBI. Four years later, Pafko was in center field for a Saturday afternoon game, April 30, 1949, against the Cardinals at Chicago’s Wrigley Field. Behind the pitching of starter Bob Rush, the Cubs entered the ninth inning with a 3-1 lead. With Enos Slaughter on second base and two outs, Rush was on the verge of a victory until Eddie Kazak singled, scoring Slaughter and narrowing the Cubs lead to 3-2. Chuck Diering ran for Kazak and Rocky Nelson, a rookie first baseman, stepped to the plate for St. Louis. Umpire Al Barlick hesitated a moment in making a call, then ruled Pafko had trapped the ball. Diering and Nelson raced around the basepaths. As Pafko held the ball, Diering scored the tying run and Nelson steamed toward the plate. “Pafko, unwilling to believe the no-catch ruling, did not throw the ball until Nelson was crossing the plate with the winning run,” the Associated Press reported. Two years later, June 1951, Pafko was dealt to the Dodgers, giving Brooklyn an outfield of Pafko in left, Duke Snider in center and Carl Furillo in right. Playing for the Cubs, Dodgers and Braves from 1943-59, Pafko batted .285 with 213 home runs and 1,796 hits. In 258 games against the Cardinals, Pafko hit .273 with 22 homers and 120 RBI. April 30th 1949,my sister Elaine was getting married. While waiting for the family to go to the hotel,my brother Allen and I watched the Cubs game on WGN-TV. on our 10″ RCA Victor TV. It was a dark over cast day. Those days,all tv’s were black and white and there was no instant replay because video tape was not yet invented. Years later,I was involved in the stage play “Bleacher Bums” and that Pafko incident is featured. I met Andy on many occasions. He was one of my boyhood idols and I cried when he was traded to the Brooklyn Dodgers. I later became known as the Bleacher Preacher at the friendly confines. Jerry: I really enjoyed reading your recollections. Thank you for sharing them here. Thanks,even if you are a Cardinal fan! I was lucky as a kid who got to see so many Cardinal teams going back to Stan”The Man”Musial who looked like a Rodan Statue at the plate,4 sack Dusak,Marty”the octopus”Marion, Enos”Country”Slaughter,Harry”The Cat” Bracheen” and listen to Harry Caray and Gabby Street on KMOX coming out of St.Louis. I always enjoyed teasing the Red-Bird fans by asking Cardinal Questions.What’s Whity Herzog first name? (it’s Doral,and if that was my first name I would call myself Whitey,too,even if I was bald! What did Pete Whisenant do twice that no other Cardinal player did? He pinch hit for Musial! And of course what was unusual about Musial’s total hits 3,630 ? He had the same amount on the road that he had at home…1815! Jerry: Love your description of Stan Musial at the plate. Well done!